The Colorado Petroleum Association (CPA) is the successor to the Rocky Mountain Oil and Gas Association (RMOGA), which served the oil and gas industry for almost 80 years. Since 1999, CPA continues to carry out RMOGA’s mission to represent all facets of the oil and gas industry. CPA promotes and protects the interests of oil and gas companies, related businesses and oil and gas users through public and professional education, lobbying, regulatory activities and media relations. 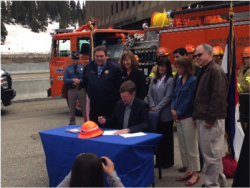 Governor Hickenlooper signing House Bill 1278, lowering the E&P waste spill reporting threshold from 5 barrels to 1 barrel. CPA has a Board of Directors that guides the activities of the Association. CPA’s President carries out Association duties as directed by the Board. CPA’s President is a registered lobbyist and experienced advocate representing the industry before numerous regulatory agencies. The strength of CPA lies with is broad-based membership and standing committees, which steer the activities of the Association in specific areas of expertise. The committee structure has proven to be extremely effective in identifying and responding to critical legislative and regulatory issues. CPA committees present a unified voice for both independent and major oil and gas companies and provide opportunities for the open exchange of information on emerging issues and trends. Standing committees include Exploration & Production (Upstream), Air & Environmental Affairs, Refining & Fuels, Tax, and Government Affairs. This is a representative sample of the issues CPA addresses on behalf of the industry, with the assistance of member companies through our Association’s Committees. We look forward to adding your company’s name to our efforts so that we can promote a strong Colorado energy industry. For membership information please contact CPA at angie@coloradopetroleumassociation.org or 720-377-0744.